Every time, after the cards are shuffled, a person indicates what card he wants, the first, the second, or the third. The spectator is always right, finding the sticker card. This can be done over and over again. Finally, our card handler reveals that the sticker card hasn't changed; however, when he turns over the other two cards a large "YOU" is printed on one card and a large "LOSE" is printed on the other card! You are clean at the end with totally examinable cards! Another bit is to show two of the same cards and one different. 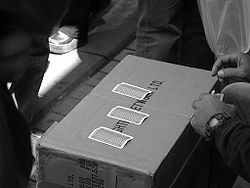 The different card is exchanged for a card a spectator choses from a deck of cards. Time and time again the cards are mixed and each time the person keeps finding his card. Finally, the conjurer reveals that this was easy because all the cards have changed to match the selected card! Then, if the magician choses, he could place a sticker on one of the three matching cards and do the routine again proving that the person really chose the same card every time. This is Jim Temple's Color Monte effect on steiroids!! The effect can also be customized for trade show work or any other kind of situation. Ron explains a couple of routines in the intructions, but a good imagination will certainly think of more effects to do! This is actually a utility Three Card Monte set.